Today's card is the Page of Swords. As with all court cards (pages, knights, queens and kings), the card can symbolize either a person or a situation. If this symbolizes a person, a page is normally a child or someone who is more immature. Swords indicates a mental or intellectual aspect. This could be one of your children or a child you spend time with. He or she may be precocious, clever, bright and energetic. He or she can be concerned with things being "fair." If there is a person like this in your life, be open to spending time with him or her, teaching to and/or learning from him or her. There is a great gift and a lesson here for you. Is it one of your kids? A younger sibling, relative or a friend? 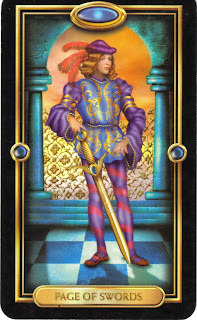 Once you have a sense for who this card is about, tune in...what's there for you? Pages can also mean communications (letters, calls, emails, etc.). The Page of Swords may indicate some kind of legal notice, something informative or analytical. Remember, this message would come from a space of intellect (as opposed to feelings or actions). If you've been waiting for news to come in, the Page of Swords may indicate that it may not come back as you have planned, but remember, it is all in order. By pulling this card and realizing this one small truth, you will be better able to position the situation as a slice of what's happening right now. Just like a book...keep reading to find out what happens next. The Page of Swords invites you to open your mind and observe your thoughts about how you see your world. This is a time for you to observe, learn, experience and process your world. I am trying to discern if this is about my son (who is concerned with fair), my daughter (who is precocious and energetic) , or my own inner child. This reading reminds me to awaken and activate my inner observer. I look forward to Tuesdays! It took me a while to pinpoint the significance of this card for me. I believe it is referring to my Inner Child and the new awarenesses I am gaining of what is called the Original Wound. All part of my utilizing the wisdom of the Enneagram for greater integration.